Ever wanted to cook something that your family will love, and your friends will talk about for days? Then let’s get started on how to smoke turkey legs! 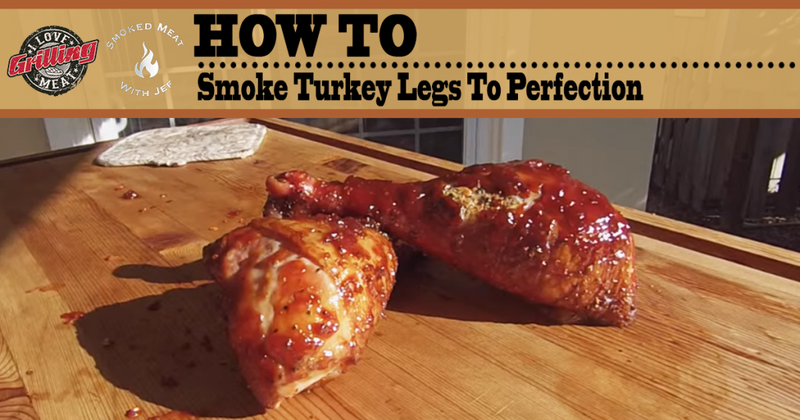 This super simple guide will take you through the process of smoking turkey legs on your home smoker. The first thing you want to do is brine the turkey legs. Put the drumsticks in a ziploc bag , and add a brine with salt, brown sugar and Worcestershire sauce . Let it absorb the flavors for about 4 hours. When the brining is done, dry the turkey legs with some paper towels. Use salted butter to slather the turkey all over to allow the seasoning to stick on the meat. Try to reach under the skin as much as you can, as well as on the outside. Lightly apply the seasoning. Get the smoker up to temp at 250ºF . You can use mesquite and almond wood . When internal temperature reaches 145ºF apply some of the BBQ sauce. Repeat every 10-15 minutes until internal temp reaches 165ºF. For the last 30 minutes of smoking, crank up the temperature in the smoker to 275ºF . When you reach the 165ºF internal temp mark , pull the turkey legs off the smoker, let them cool down a bit, and enjoy! How To Smoke A Turkey (Brine Instructions Included) Whether it is for your Thanksgiving dinner or on any other day of the year, here is a simple guide on how to smoke a turkey. This recipe also includes brining, which will result in a great smoke and a delicious meal. Spicy Garlic Parmesan Smoked Chicken Wings Are you in the mood for some smoked chicken wings? Do you also fancy something spicy? These smoked chicken wings with spicy Parmesan and garlic sauce were practically created just for you. Pitmaster Jef Spencer is just a regular guy who loves smoking meat, BBQ and entertaining friends over a great meal and cocktail.Through years of experimentation on the grill and learning from other Pitmasters he has become known for turning out some great backyard meals. (When there is Smoke at Jef’s house, the neighbors like to peer over the fence and sometimes just come on over for dinner. )As an avid woodworker and garage shop tinkerer Jef has applied his skills to build his own custom smokers and BBQs to further his love of the grill.In the last few years he has been sharing his love of smoking meat, cocktails and backyard entertainment through his YouTube channel “Smoked Meat With Jef”, where anyone passionate about grilling up a meal can find “How To” videos, product reviews, tips and tricks to make their next BBQ experience better…. and sometimes more unique.